It is shocking that someone is abused as a "lesser being" because of the colour of their skin. I understand the feeling of being on the receiving end to an extent as I have been judged, abused or dismissed because of my mid-Ulster accent. All of those who have given me abuse, have been middle class, white and relatively well off. On one occasion a retired, blue rinsed posh sounding woman in Milngavie town centre, who opposed a Yes vote (as I had been giving out Yes leaflets) told me to go back to my country (I have been in Scotland since 1994). In the same 'respectable, affluent' town (one that now has a food bank- so prejudices can go both ways), someone rode up to me on a bike and sang the first few lines of the sash because, I assume he had assumed I was a catholic. I'm not. Nor am I a nationalist. I am an internationalist and I abhorr racism and bigotry. I read a report that Tory middle England posho MPs have been caught making fun of those MP's with accents not clipped for Oxbridge debating societies or 1940's newsreels. The assumption by many that posh means knowledge- an assumption made by mostly other posh or socially aspirational people, was shown up on channel four's Benefits Street debate last night. Latte and life sucking upper middle class people sat in judgement over those who need the help of our welfare safety net. The tension was obvious. Allison Pearson, a Telegraph columnist, walked off the show after being proven to have lied in her paper column, about figures to back up her predjudices about people's lives and a part of society she knows nothing about. The judgement and snobbery (to be kind to some of them) and misunderstandings about poor people these people who have access to power share is scarey. The UK, no matter how much it is repeated that it is not by middle class snobs with access to power and the media, is still hugely class divided. 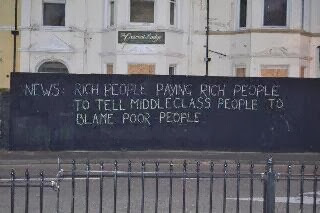 And their snobbery and attacks on the poor is a class driven war being won by them. Abuse of people because of their disadvantage- educationally, financially etc is dreadful. Abusing them does not give them the social mobility afforded to any middle class person. Stability does not come from abusing the depressed- those who have grown up in, are surrounded by, the misery of the "bucket" estate or scheme (a term I became familiar with when I lived in Wiltshire). To the street busker and to the asian Scot SNP MSP who were racially abused on camera- well done for standing up to these bullies. Bullying and predjudice needs to be confronted. Racism, bigotry, homophobia and the last "acceptable" bigotry- that against the disadvantaged. Even Graham Norton got in on it on Friday night, describing the exploited poor people on The Jeremy Kyle show as "scum." My only access to power is my piddly wee twitter account. He can say awful things to millions of people- and that - like the Telegraph's Pearson, is, at the very least, an uneducated privileged person's abuse of power. I hope in the near future, we look back at the bigotry against the disadvantaged with the horror in which we look back at "Love Thy Neighbour," and Jim Davidson's awful racism. All bigotry by privileged people is an abuse of power.